It’s Dyslexia Awareness Month this month around the world. I’m sure you’ve seen articles floating around social media about the struggles faced by 1 in 10 in the west. That number is shocking. There are as many people with Dyslexia as there are who are left-handed. This is why it is important to spread awareness of exactly how Dyslexia affects so many lives. The most common misconception about Dyslexia is that it is all about reading. People reverse letters or see shaky text. It is true that reading is a huge part of it, Dyslexia impacts on many other areas in a person’s life. There are also strengths shared by many Dyslexics that are often overlooked. Working Memory is often a major area of concern for people with Dyslexia. Remembering names, dates and details is difficult. It is important that people be given time to access those supports before required information needs to be shared. The opposite side of this is that people with Dyslexia often have incredible long-term memories. They are often valued for their ability to share what they have experienced. Their impressions of an experience often offer keen insight not always noticed by others. 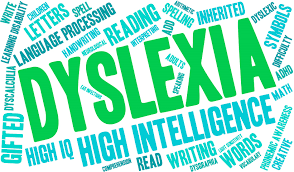 People with Dyslexia may find constructing written work difficult. They will often make spelling mistakes or have difficulty organizing their thoughts. However, their strengths lie in idea formulation. They will often be able to tell you details of a theory using a range of vocabulary. They thrive in the big picture. When considering how best to support adults and children with Dyslexia, it is important to remember that support does not just mean helping in areas of need. It also means providing an environment where people are allowed to draw on strengths so that they can thrive in their success.